Our combined production space of 169,000 square feet is outfitted with the most advanced machining capabilities available today. With our commitment to continually invest in new technology, our customers are assured the best! 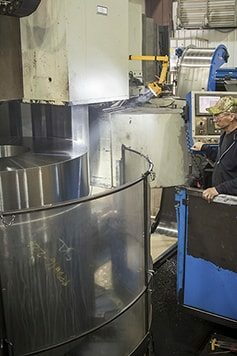 We operate more than 40 conventional CNC mills both vertical and horizontal and we are closing in on a fully CNC die for both solid and hollow components. This will allow our customers to experience unparalleled advantages in consistency, repeatability and quality. We also house complete heat-treating facilities at each one of our locations. 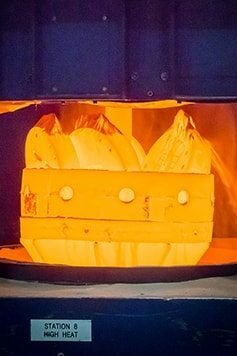 Our heat treat team works closely with our steel suppliers to assure the durability and integrity of the material in every tool we produce. Using only material from premium steel suppliers assures the highest grades of certified H-13 steel is used for your tooling. The work force in our Production Department has decades of on-the-job experience. Our cross training efforts have achieved a production employment base that has mastered our complete construction and assembly processes. In fact, many of our production employees are also trained in design and programming. This is a luxury for our valued customers, who can be assured that the manufacturing of your tooling is handled by some of the best minds in our industry. Expand our In-house heat treat facility and Metallurgy Dept.